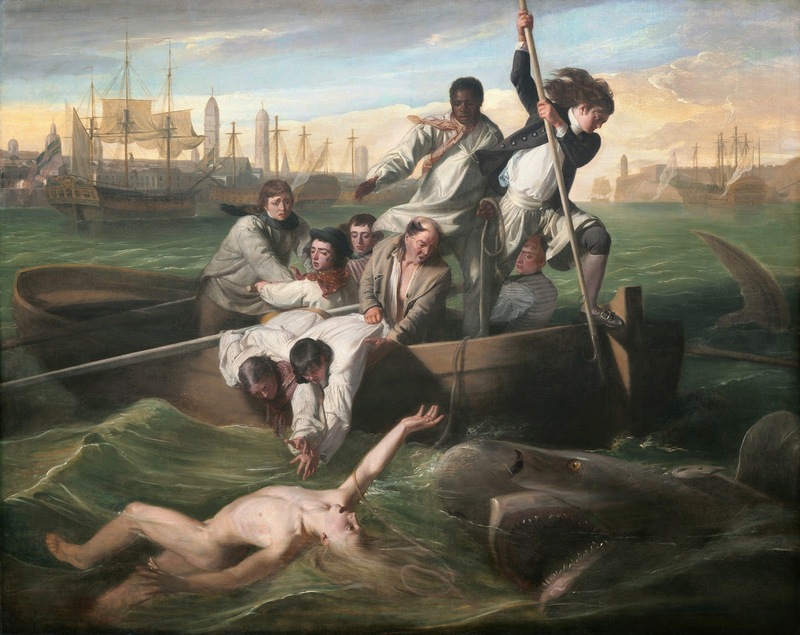 Watson and the Shark, John Singleton Copley, 1778, National Gallery of Art. 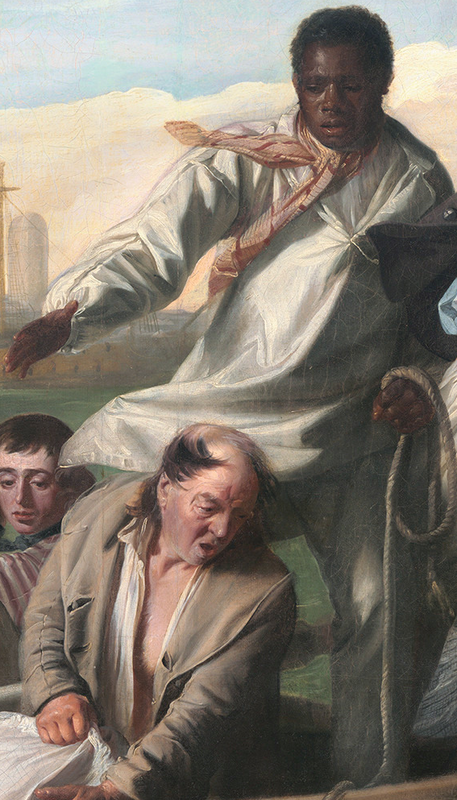 For some reason, I had neglected to include what is possibly the most famous image of British sailors in our time period until nearly 200 posts into this blog. Copley's piece is a wonderful composition, and well beyond my poor ability to interpret fine art. Historically, Brook Watson, the title figure of the piece, was 14 when a shark attacked him in the West Indies. Though he lost his leg in the attack, Watson survived and became a prominent merchant and Tory politician. 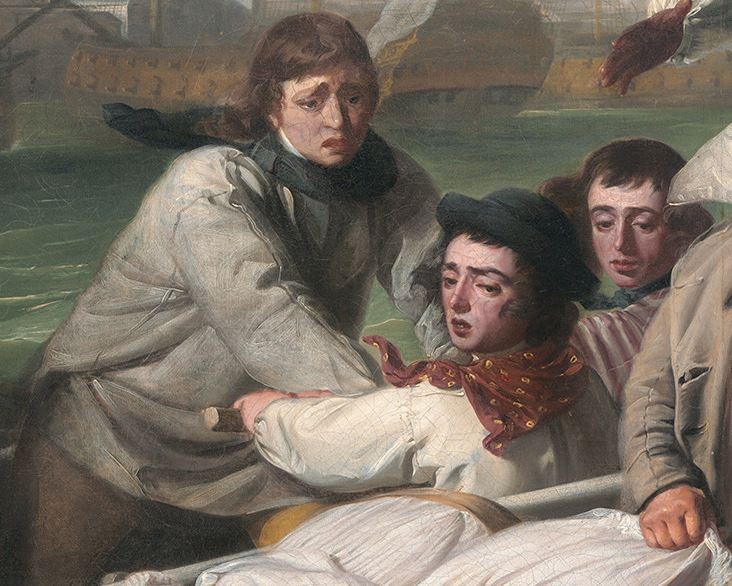 It has been said that "Watson and the Shark" is an allegory for Britain: British sailors, the personification of the empire, rescue the helpless child from the sea and strike a blow against the beast that would consume him. Coming after the stunning defeat at Saratoga, the loss of Watson's leg may represent the likely loss of the North American colonies. Of course, there are several interpretations, and we aren't examining the metaphor today, but rather the sailor's clothing. Atop the bow and with eyes wide, a tar thrusts the boat hook at the shark. His hair is long (as are most sailors in the piece), and he wears a dark single breasted short jacket (black or a very dark blue) with death's head buttons. His three button mariner's cuffs are buttoned shut. At the back of the coat is a piece of sky blue fabric, but I haven't yet placed what precisely that is; perhaps lining? He wears no waistcoat, but does wear white slops with a two button fly closure over dark blue breeches with gray stockings. Further astern three men work the oars, though cast worried eyes to poor Watson. The furthest tar aft wears an odd gray overshirt or jacket above a white shirt. His neckcloth is black and his trousers or breeches are brown with a broad fall fly. 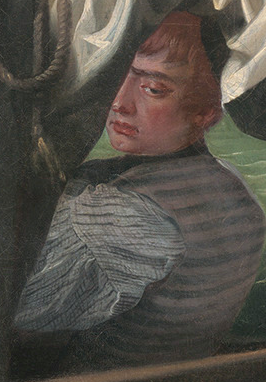 On the oar are a pair of sailors: one with a black round hat with upturned brim, yellow dotted red neckcloth, and white shirt, the other in a striped shirt or jacket and blue neckcloth. 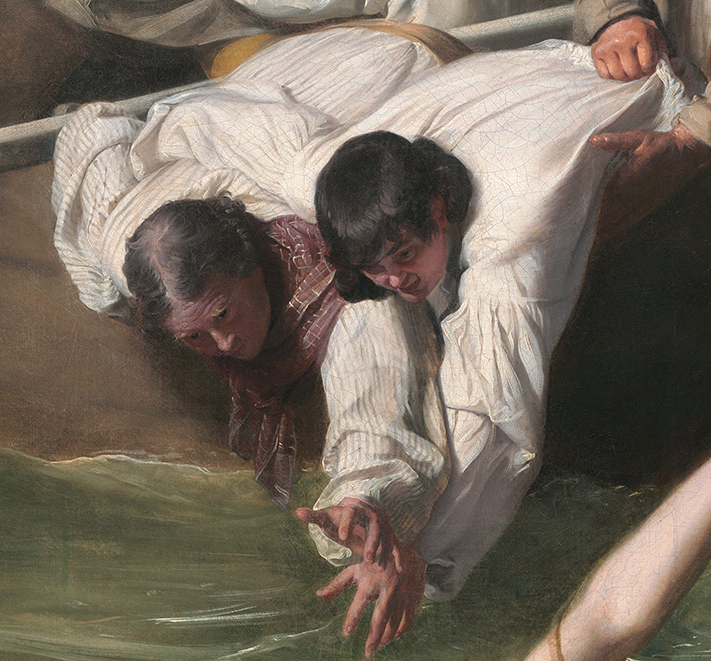 Leaning over the gunnels with outstretched hands, a pair of sailors cling to each other and to their vessels. One wears a striped shirt and buff colored breeches or trousers along with a checked red neckcloth. Of the other we only see a plain white shirt. Clutching one of the potential rescuers, this old and balding jack casts his eyes to the shark. He wears a double breasted and loose fitting jacket with no waistcoat or neckcloth, and an open white shirt. With a loose coil in one hand, and the other cast out, it appears that this mariner has just cast a lifeline to Watson. He, like the fellow helping the oarsmen, wears a sort of overshirt, with another shirt beneath it. His red neckcloth is striped and his trousers are white. A black neckcloth, blue checked shirt, and brown waistcoat with horizontal blue or gray stripes make up his slop clothes. I have seen references to 'smocks' in lists of sailors' belongings. 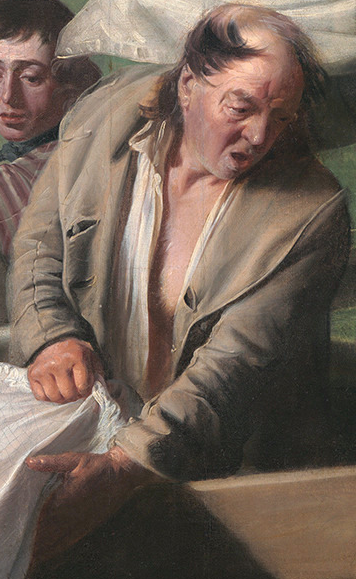 That might describe the overshirts in the painting. Now that you mention it, that makes perfect sense! This is the problem with my being so narrowly focused: the obvious can be lost behind my blinders. Thanks!